Last year alone, we saw nearly $800 million invested in longevity startups — over double the approximate $400 million invested in 2017. I’ll begin the series by explaining the nine hallmarks of aging, as explained in this journal article. Next, I’ll break down the emerging technologies and initiatives working to combat these nine hallmarks. Finally, I’ll explore the transformative implications of dramatically extending the human health span. Americans spend, on average, $8,915 per person on healthcare — more than any other country on Earth. Prescription drugs cost around 50 percent more in the U.S. than in other industrialized countries. At current rates, by 2025, nearly 25 percent of the U.S. GDP will be spent on healthcare. In 1841, a 5-year-old had a life expectancy of 55 years. Today, a 5-year old can expect to live 82 years — an increase of 27 years. 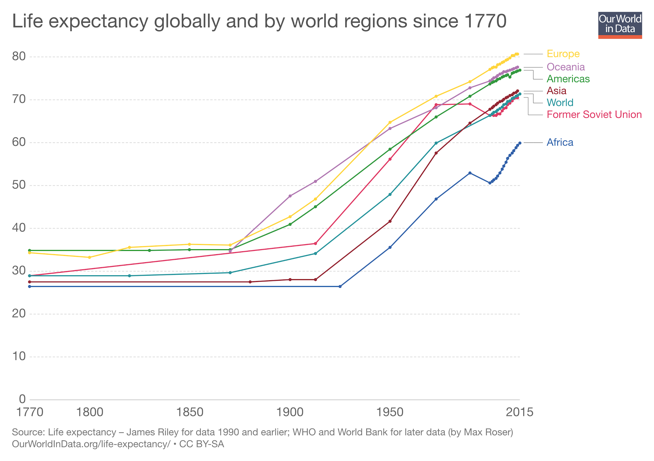 Figure: Around the globe, life expectancy has doubled since the 1800s. Figure: A dramatic reduction in child mortality in 1800 vs. in 2015. Following are the nine hallmarks of aging. I’ll share examples of health-tech and longevity technologies addressing each of these later in this blog series. Now, exponential technologies like artificial intelligence, 3D printing and sensors, as well as tremendous advancements in genomics, stem cell research, chemistry and many other fields, are beginning to tackle the fundamental issues of why we age. Each year at Abundance 360, I host a panel of world-class longevity researchers and CEOs to update our members on the current state and near future of these technologies. In just two weeks, I’ll be joined by Dr. Robert Hariri, Founder and CEO of Celularity, and legendary investor Jim Mellon of Juvenescence for a conversation on Longevity and Vitality. To apply for A360 and share your story, visit a360.com.